The project to build the new super-tall tower set to be 100 metres higher than Burj Khalifa is now under way, with Aurecon appointed as engineer and archi­tect of record on the project. Aurecon will support the tower’s creator, Santiago Calatravra, who is leading the design and engineering works. The pair will collaborate on a range of technical features planned for the tower, which will be at the heart of Emaar Properties’ Dubai Creek Harbour development. 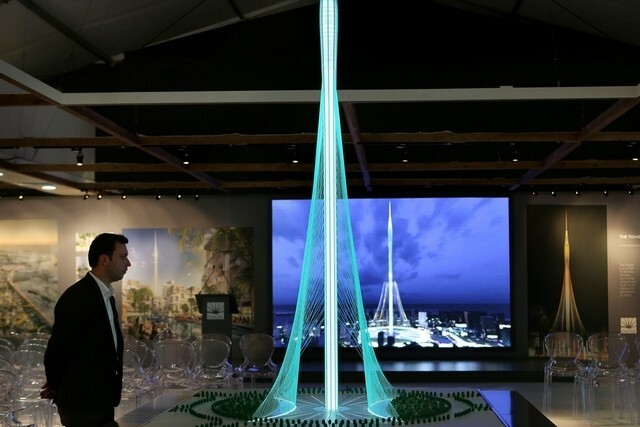 It will be at least 928 metres high, according to Emaar’s chairman Mohamed Alabbar, and comprise a central concrete column supported by a network of steel cable stays. The top of the structure will house an oval-shaped bud containing 10 observation decks, including a viewing platform known as The Pinnacle Room offering 360-degree views of the city. The bud will also contain a boutique hotel, vertical gardens and meeting rooms. “The Calatrava team were looking to work directly with experts who have had hands-on project experience on other super-tall and similar mega-projects,” said Adrian Jones, Aure­con’s project director. Aurecon is a building consultancy that was formed in 2009 following a merger between the Australian engineers Connell Wagner with South African practices Africon and Ninham Shand. The company is working on a number of important GCC projects, including a Strategic Transportation Master Plan for Dubai’s Roads and Transport Authority and in Qatar it is working on the expansion of an aggregates terminal for Qatar Primary Minerals Company. The tower is scheduled to be delivered ahead of Dubai’s Expo 2020 programme beginning in October 2020. It will cost US$1 billion to build.